I'm sure most of you have heard of the Argentine firm Bersa, S.A., but for those who haven't, here's a quick rundown. The company was founded in the mid-1950s by three Italian mechanical engineers—one of whom had worked for Beretta—who'd emigrated to Argentina to make parts for the now-defunct arms manufacturer Ballester Molina. In 1959 they introduced their own .22 pistol, the Modelo 60—a modified Beretta design that sold extremely well—and in 1989 they introduced their first full-size combat pistol, the 9mm Modelo 90. In 1994 they brought out the Thunder line, which have steel slides, alloy frames, double-action/single-action triggers and slide-mounted decocking/safety levers. The Thunder 32 and 380 are blowback designs while the Thunder 9 and 40 utilize a locked-breech, short-recoil system and high-capacity magazine. Today the Thunder 9 is the standard sidearm of the Argentine Armed Forces, Argentine Federal Police, Buenos Aires Provincial Police and number of other South American law enforcement agencies. But wanting to grab some U.S. market share, the company designed a polymer-frame pistol, the BP 9 CC (CC for concealed carry). The Bersa BP 9 CC has a square-profile steel slide that reciprocates on four steel "slide-guide" rails integral with the frame. The slide has sharply cut grapsing grooves for sure manipulation event with gloved or wet hands. It's a striker-fired design, which which means there is no external hammer while its double-action-only trigger does away with the necessity for external safety levers. In fact, the only external controls are the trigger, ambidextrous magazine releases and slide-stop lever. The result is a smooth, snag-free exterior, which is just what you want on a handgun that is designed to be carried and drawn from concealment. Thanks to its polymer construction, the grip is only 0.92 inch wide. An accessory rail on the dust cover allows mounting of lights or other tactical devices while textured "finger locater" pads are situated above the trigger guard to help the shooter keep his trigger finger away from the trigger when not intending to fire. The three-dot, drift-adjustable sights are steel, and behind the ejection port is a loaded-chamber indicator. A single column, eight round magazine is retained by ambidextrous magazine releases and has an extended base pad to provide a full three-finger purchase on the gun. 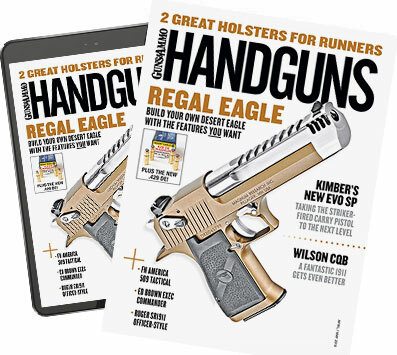 Magazines fall free loaded or unloaded, slide forward or locked back. The BP 9 CC uses a variation of the tried-and-true Browning locking system in which the hood of barrel chamber moves up into, and bears against, the front edge of the ejection port. Besides its double-action-only trigger and loaded-chamber indicator, the BP 9 CC has a passive firing pin safety that prevents the pistol from firing without a complete stroke of the trigger while a magazine disconnect safety prevents it from being fired with the magazine removed. The Integral Blocking System on the slide is activated by turning it 45 degrees with a supplied key that locks the sear and slide in place, preventing unauthorized firing. My initial sample pistol displayed good materials, fit and finish. I was taken with its ergonomics; it's a naturally pointing pistol. The thin cross section of the grip, which I believe is one of the narrowest of this class of polymer pistols, will make it a natural for people with smaller hands. The trigger had a bit more than a half-inch of take-up before it broke and little overtravel. While the trigger had a bit of staging halfway through the stroke and felt a bit mushy. Pull weight was 4.9 pounds, according to my RCBS trigger scale. The controls were well located and easy to manipulate, although the magazine releases required quite a bit of pressure to activate. Test firing was conducted from a rest at 15 yards with three different types of 9mm ammunition; results are found in the accompanying chart. I thought the groups were more than adequate for a compact, service type pistol. After chronographing was complete, I set up a pair of combat targets, belted on a Gould & Goodrich Yaqui Belt Slide holster and proceeded to run it through a number of drills, including: draw and fire double-taps at five yards; draw and fire head shots only at five yards, combat reload and repeat; and draw and slow-fire from seven yards. The Bersa performed decently in these drills, although the mushy trigger caused a number of my shots to hit lieft. The sights were large and easy to acquire, and recoil control was excellent for pistol with such a narrow grip. The difficult mag release slowed reload times. Also, after I had run about 200 rounds through the BP 9 CC I began experiencing extraction problems. The extractor would slip off the case rim, leaving the spent case only partially extracted from the chamber. Per Handguns policy, I requested a replacement pistol, which ran perfectly. In addition, the magazine release buttons on this pistol were much easier to operate. All in the all, though, the BP 9 CC proved a fine-handling pistol with more than acceptable accuracy and good recoil control for a pistol of this size and weight. I feel it would make a practical concealed-carry pistol. Smallest avg. group: 147 gr. Federal Hydra Shok—2.3 in. Largest avg. group: 124 gr. Remington FMJ—2.6 in. Note: Group size is the average of three five-shot groups fired from an MTM K-Zone rest at 15 yards.